Out on the waves of the Atlantic Ocean, crews on this year‘s ARC rally are happily munching down the miles towards the Caribbean. 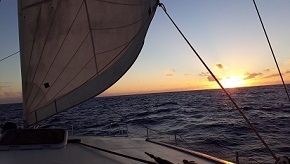 Leading the charge, the boats sailing with the ARC+ route have been at sea for just over a week since leaving Mindelo on Wednesday 21 November. Front runners on board X-Yachts X6⁵ Nika (MLT) have a mere 500nm to go to reach the rum punch now, storming ahead of the fleet some 100nm ahead of their nearest rivals. But of course the ARC is a rally and not a race, and the blogs and pictures sent in from the boats at sea are a brilliant example of why rushing to the line is not at the heart of their ocean crossing experience. Instead, it’s about enjoying remarkable sailing, the company of friends on board, the camaraderie of being part of the fleet and making that long-held dream of sailing the Atlantic a reality. Across each of the three groups, ARC+, ARC+ St. Vincent and ARC, routines have been firmly established on board with each boat operating a watch-system, and sharing the domestic duties. Days are punctuated by the excitement of catching fish, or a visit from a playful pod of dolphins, sail changes and perhaps a special meal. By email, Rally Control sends positions of the boats in each fleet, and the twice daily SSB-Radio Net keeps the boats in touch with one another and develops those friendships made in port. “This community aspect of cruising in company (in its loosest term) is a comfort over long distances and one of the main reasons for us joining the ARC+. That, and the camaraderie and social side of this life in ports is what sells this event.”wrote the crew of Beneteau Oceanis 473 Clipper Allegrini “It creates a kind of environment that's an odd thing in this modern world, I suppose because you immediately have something in common and the fact that you have a limited time together before you're off sailing again. Friendships are made very quickly, so when you bump into them again in another anchorage or port, it’s like meeting old friends, a little peculiar, but nice all the same. Excuse the pun, but maybe because were "all in the same boat." Tracing the rhumb line, fifteen boats sailing towards Blue Lagoon in St. Vincent form the second wave of this year’s rally. 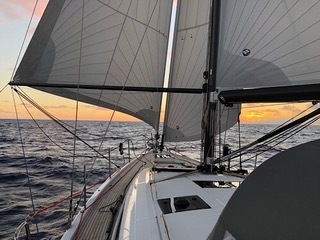 Since departing from Mindelo on Sunday 25 November, it has been plain sailing on this second leg weaving steadily towards the newest destination in St. Vincent and the Grenadines. Just over 100nm separates the distance to finish across the fleet, with the exception of late starter Zirocco. With at least a week of sailing still to go, that could all change before they reach Blue Lagoon, as they continue to settle into the passage.